March 19th is National Quilting Day this year. In honor of this great day my Quiltsy Team on etsy decided to do something special. 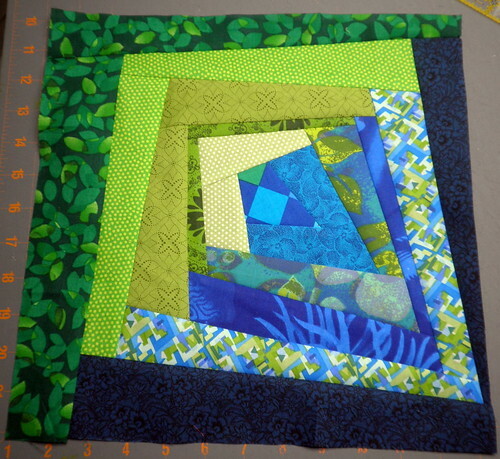 Each person that signed up is making a log cabin block (in cool family colors - blues, greens and/or purples) trimmed to 12-1/2 inches. Those are the only requirements. How many "logs", width of logs etc., is completely open to individual interpretation. If they are not the first person, each participant sews their block onto those before them, adding to the row before mailing it to the next person in their row. The last person sends the entire row to annsquiltnstuff who is going to finish the quilt for us. 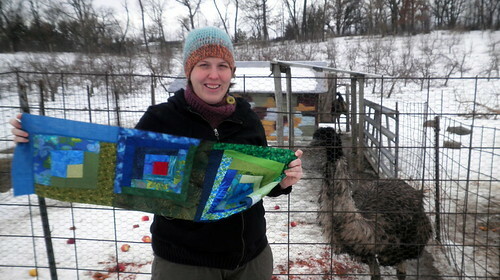 Before mailing it on, we were asked to take pictures of us with our portion of the quilt in the location we made it (above you can see me at my apple orchard with our two emus – Mac ‘n’ Tosh) in the background. This way we can show people all the different places the quilt was created. The next step is to mail the strip to the next person on the list. When the row is complete they will all be mailed to a quiltsy member to finish up the quilt. When this is all said and done – the quilt will be listed in the Quiltsy Shop on etsy to help raise money to support our team and future activities. 45 members are signed up to participate in this little adventure – I can’t wait to see the final quilt! Just before the weekend I received a squishy little package containing a beautiful start to a fabulous quilt row. 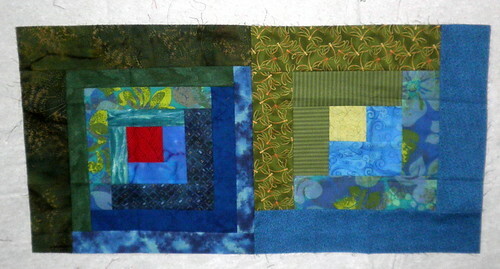 One of the blocks was done by HeatherLairDesigns (Gimli, Manitoba, Canada) and the other by lmkquilts (Owatoma, MN). Of course – I couldn’t stick to the traditional log cabin so I had to ‘wonkify’ mine a bit – I had a lot of fun with this one! All three in a row…(the NORTH row). 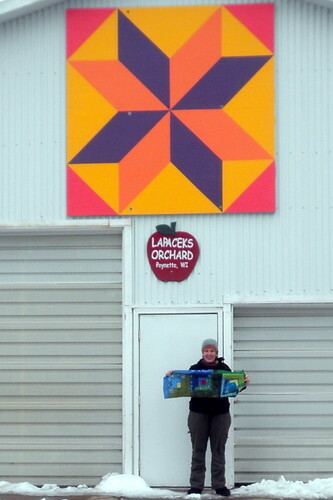 And here’s a picture of me with the North Row in front of our barn quilt. And now, I have the North Row all packaged up and it will head to Yellow Springs, OH, for ForQuiltsSake to add onto it next! Keep an eye on the Quiltsy Blog to see more about the rest of the rows (and watch as this one grows). And, a special thanks to Whimbrella for organizing all this and really getting the ball rolling – what fun!